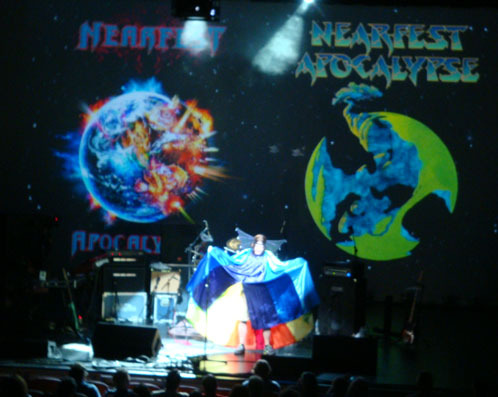 At arrival at the Zoellner Arts Center it was obvious that it gonna be a very nice time at this Nearfest. The venue looks very nice and seats are located in a way, that from any place there was a good view to the stage. Eloy-fans were already seen at the beginning, recognizeable by their T-Shirts - some official ones and also some prints I have never seen before. There were plenty of booths in some rooms right next to the hall from performing bands, CD-dealers, and the famous artists Mark Wilkinson and Roger Dean! Incredible. Twelfth Night - Knowing Twelfth Night from their 'Live and let live' CD only, where Geoff Mann was their singer in the early 80ties, I expected a nice Neo-Prog-show. 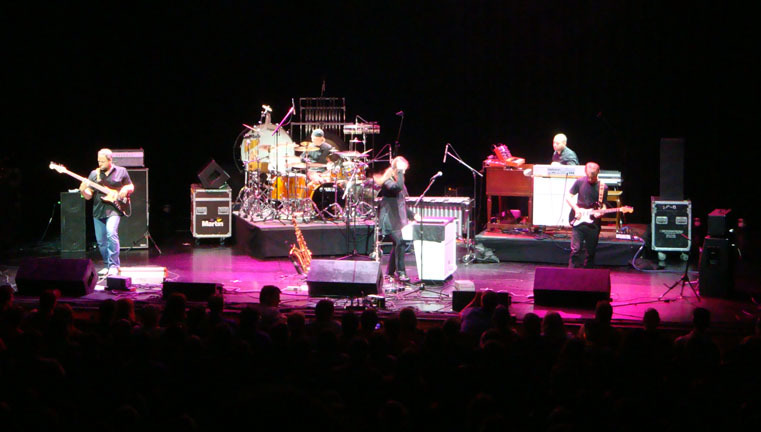 But unfortunately this turned out to be the worst appearance of all the bands I have seen at Nearfest. The leader of the band had some problems with his mic and also with singing as well - the vocals, especially older tracks which originally Geoff Mann performed, sounded really awful. People not able to stand it were massively leaving the show. The band also had positive moments, e.g. the solo from Andy Sears at piano and vocals. Anglagard - I already heard from this band before, but never got into their music. The audience loved them, and me also. 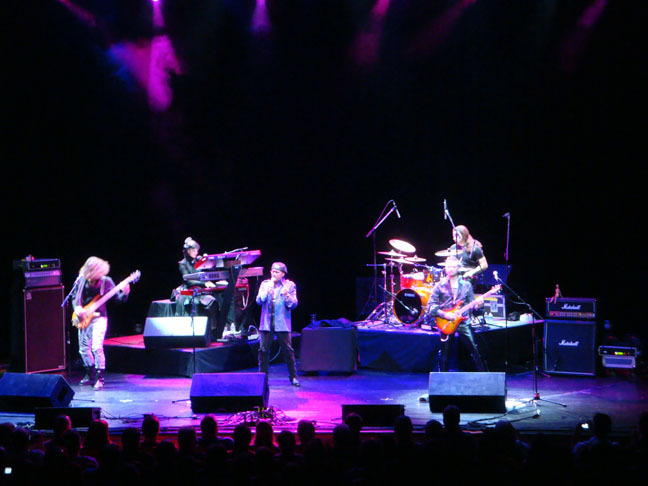 Very skilled musicians, very good keyboards, mellotrons and a drummer - wow! Not only skilled, but also very experimental! 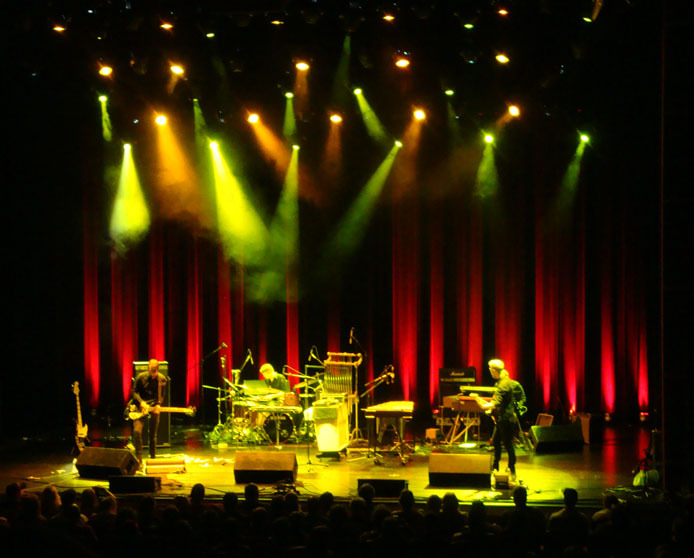 I would never buy a CD from them, because their music does not give me the feel of relaxing and is too intense, but the show was really very good. After Anglagard there was a longer break. Time enough for a short trip to the local brewery with my friends to have dinner. When we came back we re-entered the parking garage again and were in time for Renaissance. Renaissance - the headliner of Saturday finally did a very good show except for the beginning. They started to play a song from tape as intro which was way too long until the musicians entered the stage. Not very nice. As the music of Renaissance is really more relaxing, not complex and not dynamic, it would have been better that they've played the afternoon and Anglagard would have had the night performance. I got very tired. 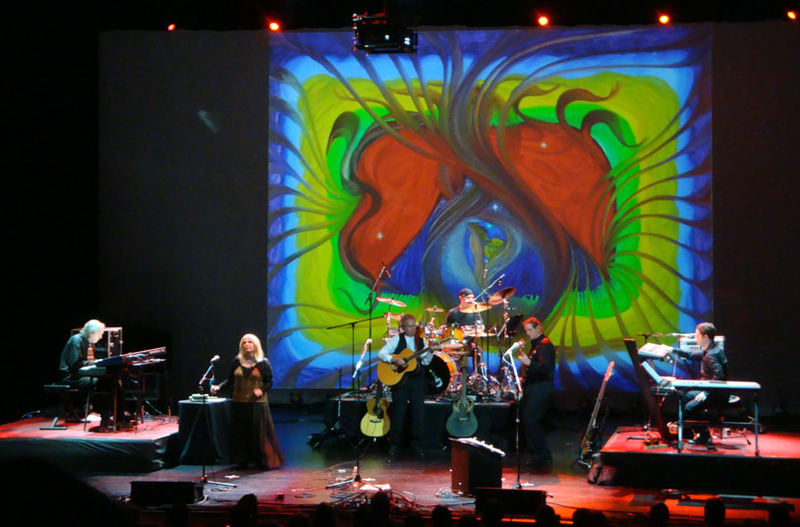 The band also used paintings from Annie Haslam for their slideshow. This Saturday was already very impressive. Especially the production around the show (video clips, interviews, program book) was something I never saw before and is not comparable e.g. with the European Prog-Festival at Loreley. The 3rd day started with a short video from Frank Bornemann with a message for the fans. Some missed that, because they were a bit late that morning. Gösta Berlings Saga - The 3rd day stage appearances started with, for most of us, the best performance of the Sat & Sun shows. This band, also coming from Sweden as Anglagard, finally appears to be a light version of Anglagard, sharing the same keyboarder and coming with much more melodic compositions, very dynamic and complex. I had goosebumps. For the last song the drummer genius from Anglagard joined the band and added percussion, mellotron and other noises to the music - just incredible. Il tempio delle clessidre - At the day of Italia's Euro 2012 quarter final against England the Italian band performed directly before that soccer game. They did an extravagant show, one song about witches was performed with masks. Especially the keyboard player was very good. Bad that the singer did need the text presented behind the monitor boxes in order to perform. I also had the feeling that his vocals did not fit to the music. 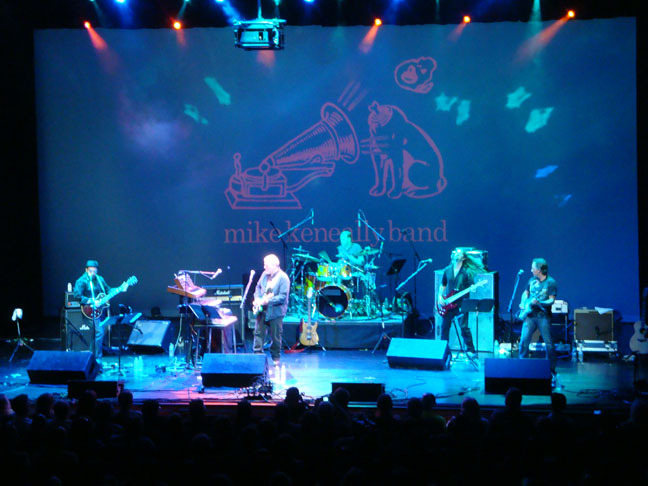 Mike Keneally Band - Reading the Nearfest magazine the night before, I was expecting a very good show, not knowing this band and it's style. It was terrible - we could not stand it, which results in us leaving the venue after the 4th or 5th song. It was a good performance, no doubt, and good musicians, but the songs were not really interesting enough to stay. So we did wait outside, and met a lot of Eloy fans being sad about the cancellation. Then we went to dinner and were back in time for Eloy's replacement U.K. at 9 pm. But Mike Keneally was plaing until 7 pm which resulted in a delay - so U.K. did do a soundcheck until 10 pm. 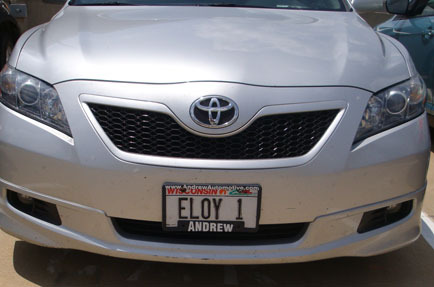 Time enough to meet even more Eloy-fans coming from all different locations around the world, especially one German speaking guy from Brazil and Mark from Milwaukee, Wisconsin, the owner of the car with the Eloy-license plate. Announcements were made, that filming and photographing are strictly forbidden at the U.K. show. After being back at the seats there was first a big farewell for the Nearfest, with all the organizers and helpers. And there was a long wait for U.K. to come on stage - very long. This did last so long, that some people started to shout for ELOY - not very nice from these fans, but also well understood, because it was not very nice from U.K. to let the audience wait so long. During the show it was then obvious, that the two very skilled famous artists on stage having also some attitudes. It seemed not to be a band performing there on stage - the performance was good and interesting, but finally I often had visions about Eloy performing there on stage. The audience would have been much more enthusiastic, and I would have expected that people jumping off their seats for applause during the show - what did not happen for U.K.. Finally the show ended after midnight with another farewell. All in all it was a great experience, but sadness remains about the fact, that Eloy did have these circumstances which ended in the cancellation of their appearance there. But what will happen in the future? Will the band ever play in the US? Is this dream for many fans, which was so close to getting reality, now over? I do not know. 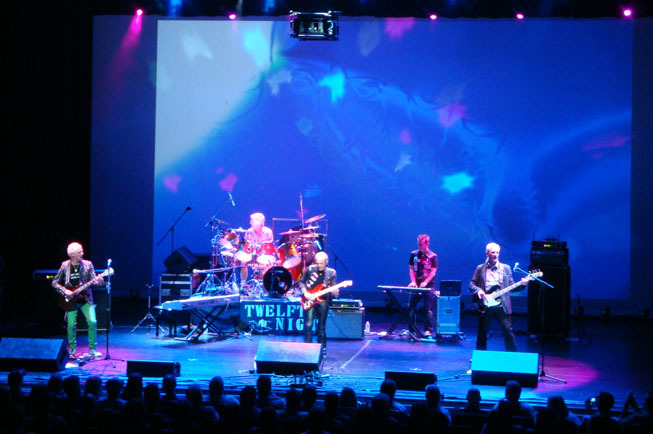 I only know that there are many fans out there in America which really want to see them perform there at such a nice audience, at such a nice venue as it was there at Nearfest 2012. But where are these fans? I have the feeling that all of you need to register here in this forum and tell us your story - how you heard about Eloy, how many friends you have who also love the music of Eloy. My wish is, that the Eloy-fan-community in the US gets more transparent and touchable for us. Only you, the fans, can motivate the band to travel over the ocean - not a high offer from a concert agency or organizer. Of course the salery must cover the expenses, the flight, the transportation of special instruments, accommodation etc. but what pays back most are you, the fans, and your response. Please register to this forum and tell us your story! Great overview Robin, and on the mark, although I apparently like Anglagard a little more than you. ;-) Yeah, not the most relaxing of music, but great stuff. 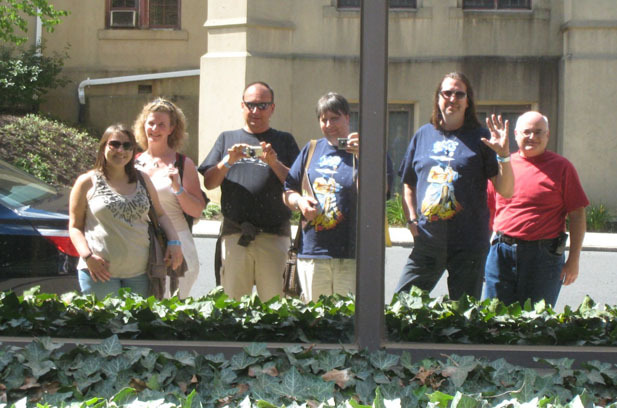 Anyhoos, I was one of the Eloy fans there, too, and have attended most of the NEARfest events, missing only 3 over the years. Been a fan of Eloy since I found a copy of Colours in a friend's record collection. I have some friends who are fans. I was totally stoked about getting to finally see them, as it's not affordable to travel to Europe to see one band, much as I'd love to. I did wear my Eloy shirt (not the nice Ocean ones y'all have, but just simple blue logo on black T-shirt) on Sunday night - in support of the band. And I was one of those yelling Eloy waiting on UK to take the stage (but I wasn't booing as some started to do, unfortunately).